The upcoming Apple iPhone 6 has, by now, entered the minds of many consumers, what with all the leaks. We're expecting the biggest jump in display size since the original iPhone, along with a bump in pixel resolution, and a refreshed, iOS 8 software. This being Apple, however, plenty of people are anxiously awaiting a reliable early peek into the design of the next iPhone, though that is obviously a closely-guarded secret. But we have our dummies -- phones that visually represent the design of an actual phone -- and by the hundreds, it feels. These have become so popular, that they tend to remind us of the iPhone 5c rumor cycle. Case in point: despite the widespread disbelief among fans, the many iPhone 5c dummies indeed turned out to be the real deal. That's not to say the dummy some of you may be seeing for the first time is a sure thing, but it could very well be. Either way, many of us have already struck an acquaintance with these hollow iPhone 6 mock-ups, but the latest snaps, courtesy of Apple insider Sonny Dickson, are worth a separate mention on their own. That's because they paint a telling picture of the iPhone evolution, from 2007 to today, and highlight the design refreshes it went through, including the supposed new iPhone 6 look. But enough talk -- check them out! The gold was terrible on the 5s and still is terrible on this dummy. Only gold device I have ever thought was good was the Gold Brown on the Samsung Tab. Even my beloved G2 is terrible in gold!! Does making a dummy phone and comparing it even prove a point? It's like taking a kid toy phone and comparing it with other phones. Those iPhone 6 bezels are embarrassing. You mean like the huge bezels on the s5? It's not about bezel, it's about performance, value, support, Eco system, and resale value. Exactly. And it's like iPhones have those things, right? Performance on the Safari which lacks flash and feautres Value using cheap glass and cheap low grade single layers aluminum which costs less than polycarbonate Support charging and arm and a leg to replace a cracked screen and overpriced warranty ,also medicare midrange device with a highend price in return they give back onethird but makes near half in profits to provide support Closed resticted platform, being told what you can't and can do. Lmfao . what is your life restricted from what you can and can't do. So when you said why does it bother me if you camp outside with your middle aged wife I should not interfere nor have my opinion. Resale value, they only make 1device a year why would it depreciate. Apple's theory take it or leave it. Others… . You're now on my "don't bother list". It's useless, pointless, and beneath me, to respond to you after this. Two things. First, that picture that shows the gs5 side by side with the alleged iPhone 6 shows that the size is pretty much the same but the GS5 has a much bigger screen, which means the GS5 bezels are nowhere near this. Second, the gs5 was the first Samsung flagship with huge bezels. 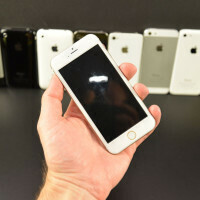 This is the 6 iPhone with huge bezels so keep smoking in your iuniverse buddy. If they showed this next to the G2, the difference would be extreme. Bezels are one of many important aspects that shouldn't be overlooked, it affects how you hold and use the phone, and what type of enjoyment you get from the screen size it allows. You're kidding, right, Darkk? Comparing the bezel size of the S5 to any iPhone is just moronic. No comparison. it's like apple acting like samsung when they had the galaxy s3. i'm just not sure if it's going to make things better for apple. the ugly S3 paved the way for greater success for samsung. this ugly new iphone will probably be doing the opposite. they didn't even exert any effort in reducing those side bezels. Looks nice, but the white bands are too thick. Luckily this isn't the iPhone 6.
the front is complete, the back is still "under-construction" .. it has the same back as the 5s had in leaks if you remember last year ..
iPhone, iPhone 3G, iPhone 3GS, iPhone 4, iPhone 4s, iPhone 5, iPhone 5c, iPhone 5s, iPhone 6. Hmmmmmm....I don't see the entire iPhone family pictured. Close enough though. I'm going to be honest, It's really unfortunate that most people on PhoneArena are seemingly children who are always butthurt by the mention of iOS or iPhone. (I won't mind the downvotes by the way). I just so happen to really like iOS. I never thought that I would be open to such a large screen simply because I would wonder how people handle the GS5 etc, but I've realized that because I know iOS will be on it, it's easy to justify possibly getting a 5.5" version. P.S. Kids, learn to spell and use grammar. That would be awesome.